The Troop 101 Webelos Fun Day is set for Septemgber 20 & 21. Webelos, please arrive around 10 a.m. We have lots of activities planned (a tentative schedule is below). Take the Mox-Chehalis Rd exit at about mile post 6, go left over the freeway and head south. This road makes a T with Hwy 12, turn left (south) on Hwy 12 and take the first immediate driveway on the right; only about 50 feet past the intersection. This small private driveway crosses the railroad tracks, pass a side driveway on the right that goes to the house. Continue straight and the drive curves to the right. 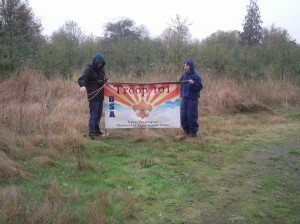 Hopefully we will have a Troop 101 sign at this point. Follow the drive down to the brown metal barn. If you miss the Mox-Chehalis Rd exit, continue on WA-8 towards Elma, take Hwy 12 south, and look for the driveway immediately after the Mox-Chehalis Rd intersection at Malone. No other program for Sunday morning, Cub Scouts may leave when ready. Boy Scouts will clear the site and leave by noon. If there is an Activity Pin your group would like to work on, click on the Contact Us link and let us know ASAP. Hope to see you there! For Troop 101 Scouts who are leaving Friday, meet at the Lily Road Albertsons at 5:30 on Friday.